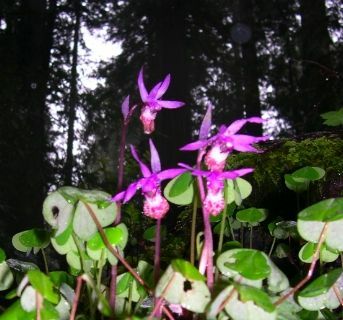 A member of the Lily family, the wild Lady Slipper of the Pacific region, Calypso bulbosa, has a single bright pink flower on a leafless stem. It grows to 10 inches tall in rich humus of shady conifer forests. Bloom normally happens in late March. The bulbs are very sensitive to disturbance, and thus this pretty forest gem is in decline due to overzealous pickers who pull the stem disturbing the roots when picking. Cutting is the preferred take method if one must pick these diminutive showy flowers.